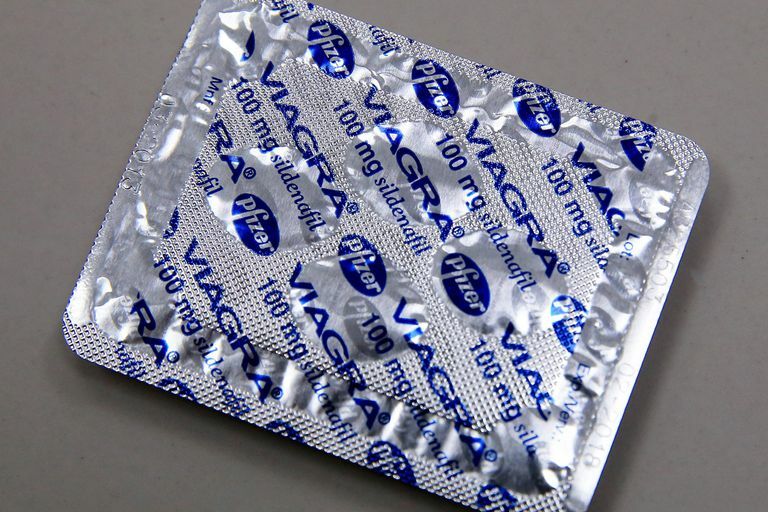 Is It Okay to Use Viagra With Heart Disease? Viagra (sildenafil) has revolutionized the treatment of male sexual dysfunction. However, its use has been said to be dangerous in patients with certain types of heart disease. The purpose of this article is to review the safe use of sildenafil in men with heart disease. Sildenafil has two actions that may be of consequence in patients with heart disease. First, it can lower the blood pressure. Second, it interacts with nitrates. Sildenafil is a vasodilator (that is, a drug that dilates blood vessels), and consequently, it lowers the systolic blood pressure (the "top" number in blood pressure measurements) by an average of 8 mmHg. In the majority of patients with heart disease, including most of those being treated with antihypertensive drugs, this is not a problem. Studies have shown that the incidence of side effects (including side effects related to low blood pressure, such as dizziness and fainting) are no higher in users of sildenafil who are also taking antihypertensive drugs. However, the vasodilating effects of sildenafil do become potentially hazardous when combined with the vasodilating effects of nitrates, drugs that are still commonly used in patients with coronary artery disease. Patients taking both nitrates and sildenafil are prone to develop severe hypotension (low blood pressure) and syncope (fainting.) Patients taking nitrates for their coronary artery disease, therefore, should never take sildenafil. Further, anyone who has taken sildenafil during the past 24 hours should not take nitrates. When sildenafil was first introduced in the late 1990s, reports of heart attack and sudden death after taking the drug appeared all over the news. Subsequent studies have suggested that, in patients not taking nitrates, the use of sildenafil in patients with stable coronary artery disease does not cause an increased risk of heart attack or death. While these events indeed occur in patients with coronary artery disease, their incidence is no higher in patients taking sildenafil. Indeed, sildenafil appears to be quite well tolerated in men with even severe coronary artery disease, as long as they do not have active ischemia (periods of time where the heart muscle is not getting appropriate blood flow, most often manifested by chest pain) and are not taking nitrates. Further, sildenafil does not increase the risk of exercise in patients with stable coronary artery disease. There are some conditions in which the modest drop in systolic blood pressure caused by sildenafil may be dangerous. Patients with severe heart failure accompanied by low blood pressure measurements may become worse if further hypotension is produced. In addition, some patients with hypertrophic cardiomyopathy may become symptomatic if their systolic blood pressure is reduced. It should be noted that, while in the past nitrates were the foundation of therapy for coronary artery disease, this is no longer the case. In the era of angioplasty and stenting, coronary artery disease is usually manageable without resorting to nitrates. Patients who are being prescribed nitrates and wish to take sildenafil should ask your doctors about alternate forms of therapy for their coronary artery disease. There are other groups of heart patients for whom sildenafil may be potentially dangerous. These include patients with unstable coronary artery disease or active coronary artery ischemia (i.e., patients whose coronary artery disease is not stable.) These patients, obviously, have an active medical problem that needs to be stabilized whether or not sildenafil is being considered. Once they are sufficiently treated, the use of sildenafil (as well as all other forms of routine, daily life such as exercise) can be entertained. Other patients who may have trouble with sildenafil are those with heart failure accompanied by borderline low blood pressure, some patients with hypertrophic cardiomyopathy, and possibly, patients on complicated drug regimens for hypertension. With these exceptions, sildenafil can be used safely in the vast majority of patients with heart disease. Kostis JB, Jackson G, Rosen R, et al. Sexual dysfunction and cardiac risk (the Second Princeton Consensus Conference). Am J Cardiol 2005; 96:313.